A Malaysian Aircraft travelling from Sri Lanka to the UK is hijacked by Iraqi terrorists. A number of British and American nationals are on board, including two British VIPs – the Chief of the Defence Staff and the Chief of the General Staff. Burnside’s chief concern isn’t about them though – Willie Caine and CIA agent Karen Milner (Jana Shelden) are both on board as well. It’s an unwritten rule that if ever a Sandbagger is in trouble, then D. Ops would leave no stone unturned to try and rescue them – but things look far from promising. The terrorists have issued an ultimatum – they want Iraqi prisoners freed or the two VIPs will be killed (one at 1800 hours and the other at 2000 hours) before they blow up the plane at midnight. It’s long been supposed that series creator Ian Macintosh had been involved with the security services before he became a writer and there’s several touches in this episode that do seem quite accurate. The first occurs early on, when Willie and Karen are comparing airline tickets. Karen’s travelling back first class, whilst Willie’s stuck in economy. He tells her that they always travel out first class (in order to be fresh for the mission) but nobody’s really bothered about their comfort on the way back. A small detail, but it does sound convincing. Incidentally, once again we see the ingenuity of YTV’s set dressing as they try to convince us that we’re actually in Sri Lanka at the start of the episode (plenty of plants are scattered about to create the impression of warmer climes). Luckily it’s only a brief scene, but you have to give them ten out of ten for cheek! Peele tell Burnside that he’s recommended he should be considered for promotion in ordinary course. Although this sounds fine, it’s actually the kiss of death – as there’s several other people on an equal footing with Burnside who will have been recommended for early promotion. So Burnside’s chances of becoming Deputy Chief are now very slim. It’s obviously Peele’s way of attempting to clip his subordinate’s wings after his repeated flouting of the accepted chain of command. As the episode title indicates, Peele favours decisions taken by committee whilst Burnside prefers to operate unilaterally. Another moment that rings true is Peele’s attitude – if Burnside mends his ways then he’s every chance of being recommended for early promotion. In this scene, he resembles nothing so much as a Headmaster, ticking off an unruly pupil. Was this the way that the SIS was run in the late 1970’s/early 1980’s? I don’t know, but it seems horribly possible. A noteworthy part of Decision by Committee is that we don’t see the terrorists take control of the plane (instead, we’re told, along with Burnside, via a phone call). Few series would have taken this route – as it’s clearly much more dramatically satisfying to show, not tell. 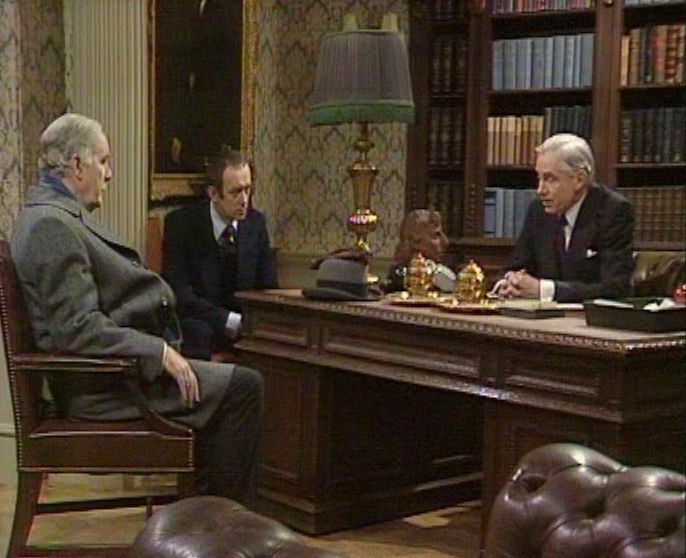 But as ever with The Sandbaggers, most of the action takes place in London, specifically in the Ops Room and in Whitehall. As soon as the news breaks, the Ops Room becomes a hive of activity (and it’s also so wreathed in cigarette smoke that it’s almost like a fog’s descended!). But although there’s plenty of talk, what actually can be done? The Cabinet is in session, but there’s no clear course of action and Wellingham later admits to Burnside that it’s better to do nothing than do the wrong thing. They could send the SAS in (as happened in Entebbe and Mogadishu) but if it goes wrong it’ll be a disaster that would dog the government for the rest of their time in power. But if they prevaricate and things turn out badly they can always blame the incompetence of the local government (the plane has been piloted to Istanbul). This is another moment that rings very true. Burnside’s itching to do something though. He’s not concerned about either the CDS or the CGS, all he wants to do is to extract Willie Caine. And it’s not because of any feelings of friendship – Burnside knows that Caine will expect something to be done and if he feels let down it could affect his confidence just enough to make him a liability in the field. It’s ironic that for all Burnside’s planning (he considers sending some of his own men in – to do an SAS style raid – despite everybody telling him that it’s an incredibly bad idea) in the end the resolution is out of his hands. Willie and Karen are able to overpower the terrorists in a brief, but bloody gun battle. It’s messy, violent and has unforeseen consequences (several passengers – including a child – are killed). The Sandbaggers is as far from an action series as you could possibly expect, which makes this scene even more of a stand-out than it already is. Top marks to Jana Shelden as Karen Milner for remaining cool under fire as well. Given the ways things could have ended, it’s not a bad outcome – although the deaths of the passengers are likely to remain on Willie’s conscience. The final scene (Burnside lies to him that he planned to send in the SAS) is intriguing. Does Willie believe him or does he simply want to believe? In the world of intelligence, the line between truth and lies remains forever blurred.